On Thursday,April 17th, 2014 at 7pm we are honored to have Paul Zammit share his ideas and expertise on Tropical Treasures: Both Inside and Outside.His talk will take place at the Knox Presbyterian Church Hall.The hall is located at the corner of Queen and Joseph Streets in Bobcaygeon. A graduate of the University of Guelph’s Plant Agriculture program, Paul is an active member of many Canadian and international gardening communities. He lectures on a wide array of subjects, including container gardening, perennials, ground covers and tropicals. A popular and engaging speaker, Paul has given presentations at many garden clubs and large garden shows such as the Canadian National Exhibition, Success With Gardening and Canada Blooms, and other horticultural trade shows in both Canada and the United States. Paul has made several television appearances on HGTV’s ‘The Indoor Gardener’, and Kathy Renwald’s shows ‘Calling All Gardeners’, and ‘Gardeners’ Journal’. He has written articles and provided photographs to past issues of The Epic Gardener. 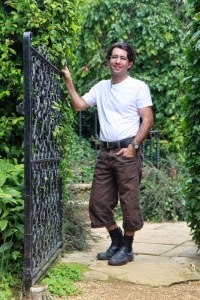 To read more about this wonderful gardening expert,who has made huge differences in garden designs of several members of our Society, check out his website at www.rhodwork.com/paulzammit. To hear this wonderful speaker there is an admission fee of $10.00.But, to hear him is well worth the cost. Bring paper and a writing instrument as no doubt you will want to record his numerous ideas for your garden. We look forward to seeing you on the 17th.